I explained this before. The water was not standing still. The "waterfall" marks also show that quiet a lot of water was coming out of the shaft so it was restless with a lot of waves. That's how I interprete those marks. 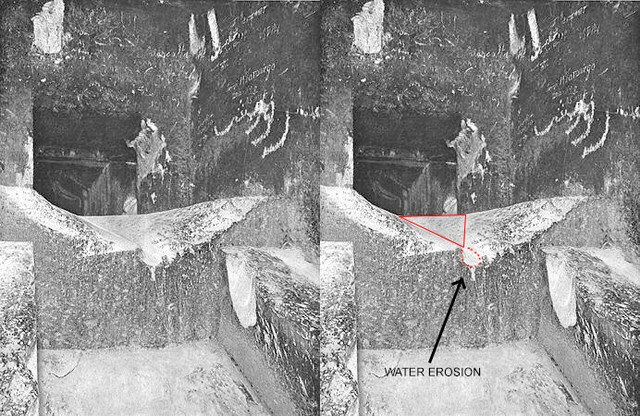 It's often said that the pyramid was flooded, but I believe that there's even more evidence that the Pyramid was DESIGNED for water to flow through. 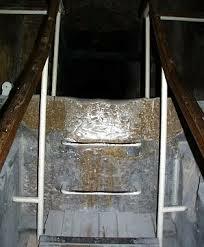 There once was a very important clue to be found in the Great Pyramid, real evidence: The Great Step, what was originally a huge V-shaped block. They destroyed one of the most important pieces of evidence. These people call themselves egyptologists but don't even recognize what is really important. It's also possible of course that they did it on purpose, who knows.